My chess team -Chess First! Academy-overcame a slow start to post a 5-4 win and collect two match points. With two rounds to go we should make the playoffs. My young opponent rushed in the opening and gave me his d-pawn for free; then we reached this position where he is losing the f2-pawn. One pawn is bad enough but two pawns down makes it hard to hold the endgame. Now check out the position later in the game. Black promoted two queens and mated the white king. Now the match score was 4-4 and Len Molden offered a draw, which would have tied the match 4.5-4.5. His opponent declined and promptly lost his queen. This was the crucial point we needed to win the match 5-4. One word of caution to online chess players. In the position below black promotes his pawns into two queens. But when you play exclusively online you get sloppy like me last year. I pushed a pawn and mechanically pressed my clock which made it an illegal move. The arbiter gave the game to my opponent and his friends wondered how an NCM-titled player can't promote his pawns!? Hahaha. So, promote your pawn, grab a queen and place it on the board, then press your clock. It sounds obvious but online the queen appears automatically or you get a prompt before the move is completed. When that becomes a habit you can run into problems over-the-board. ​ The obvious solution is to play more over-the-board chess. I spent some time this Saturday preparing for Sunday's rapid chess league. I have to play a minimum 7 games to qualify for playoff action. ​So let's take a look. Black has just played 1. ...Bb7 and your puzzle rush junkie chess coach knew what to do. Do you? It's always more fun to attack than defend. The key here is to go after your target: the black king. Examine the position and know that this is NOT a good moment to worry about material balance. Attack bravely and get bonus points for seeing deeper. This is the final position with White achieving the dream doubled rooks on the seventh rank. Note how helpless black is. The five keys below were openly "stolen" from a blog by IM Jeremy Silman on chess.com. I liked them so much, I had to share. Many chess players play for fun but if you want to get a higher rating or a chess title, you will have to put in some hard work. The 5 keys below will get you started. 1. Play opponents better than you. Sometimes it hurts when you get beat up but that's how you learn. Once in a while I get lucky online and a strong titled player plays several games against me. I get crushed but I keep on playing. GM Jonathan Hawkins published a great book called "From Amateur to IM" and in it he shows how studying the endgame helped him get to IM. You must know the basics. 3. Create a simple opening plan. It can be very simple. For example, after 1.d4 I often play Bg5, this works after d5, f5, d6, Nf6, g6, etc. Against the Sicilian you can play Bb5 or 2.c3. If you're a regular reader of this blog you will know that I firmly believe in this point. You must practice tactics because they will win you games or save you from losses. Chess.com's new Tactics Rush is a fun way to test your tactics level. You get 5 minutes to solve as many puzzles as you can; three mistakes and you're out. 5. Pick up tons of patterns. Let's take a look at a basic endgame from the 2018 World Chess Championship. Black has a dangerous passed c pawn but White neatly solves the problem. White will park his King on h1 because Black's dark bishop doesn't control that square; and promoting the h pawn is impossible without creating a stalemate. See how easy it is when you know the basics? Good luck with your chess in 2019. Draw! The White King will hide out on h1 where he can't be touched. Advancing the h pawn will only produce a stalemate. This position is from my rapid game. It was past midnight on the West Coast but crushing positions like this are easy to win. What I want you to do is notice the basic elements. White is clearly winning: he has the bishop pair on open diagonals, both rooks are on open files and the king is safe. Black's king is stuck in the middle of the board and his knights are pinned. These are basic elements for you to master: things to achieve and things to avoid. I wish you lots of wins in 2019. One key to playing better chess! 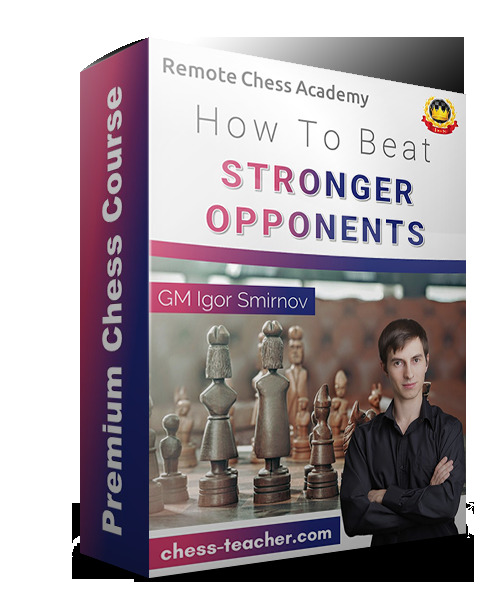 One huge key to playing better chess is playing against stronger opponents. Sure, you will get beat up but that's the best way to improve. Playing against weaker opponents will only improve your ego. When I play online chess at ICC, I hang out in the random pools, 3 0, 5 0, and 15 0 where you are guaranteed to face titled opponents. I know it's a bit scary but it's the best way to improve. If you're like me, you will probably destroy the odd mouse as you sweat your way through the games. And getting a titled scalp feels great! See my game below. 15. Qb3 Qb6 16. Qxb6 axb6 17. Be5 b5 18. Bxf6 Nxf6 19. c3 Rad8 20. a3 Bd6 21. 28. Ne3 Rdd8 29. Kc2 Kh7 30. Rh3 Rg8 31. Nf1 Rg7 32. Rd3 Rdg8 33. Rf3 Rg4 34. 47. exf6+ Kxf6 48. Re2 Rh3 49. Kg2 Rh5 50. b3 Rg5 51. Kf3 h5 52. a4 bxa4 53. 66. Ra4 Rh2+ 67. Ke3 c5 68. a6 Rh3+ 69. Kd2 bxa6 70. Rxa6 Rh2+ 71. Kd3 Rh3+ 72. If you need help, please check out the affiliate link below. It will help you in your quest to defeat titled players. 1. d4 Nf6 2. Bg5 Ne4 3. h4 c5 4. d5 Qb6 5. Nd2 Nxd2 6. Bxd2 Qxb2 7. Nf3 g6 8. White had a better move. Can you find it? And the follow up moves? Answer: 13. h6 Bf6 14.e5! dxe5 15. Bc3 threatening to win the Queen with Ra1.